Blog6: Dissertation dilemma? Hand in a monograph or papers? 6: Dissertation dilemma? Hand in a monograph or papers? Having doubts about the type of PhD dissertation you’ll hand in at the end of your studies? Getting all sorts of confusing advice, and not knowing how to move on? Let us help you out of the dilemma! 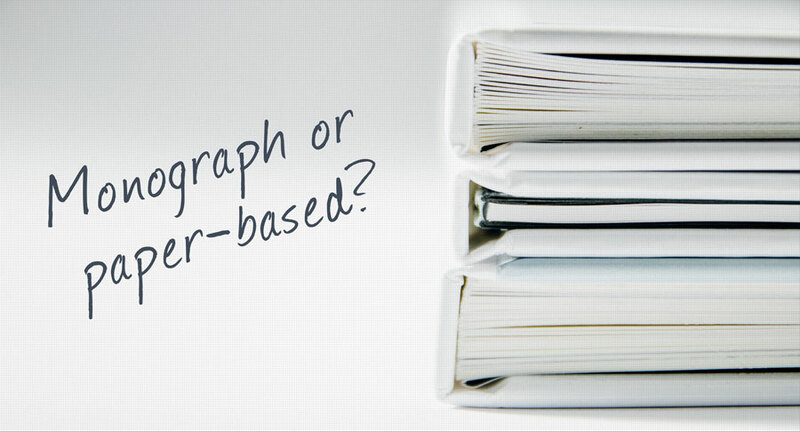 Not exactly sure what the differences are between a monograph or a paper-based dissertation? Not quite sure what the university requirements are? Uncertain if you’ve got a choice at all, and what would be the best option in your case? What you need to be aware of in order to have a smooth process? In this blog post we’ll explain the key-features of a monograph or paper-based PhD dissertation and the main points to be aware of. We’ve also compiled a super helpful fact sheet “What type of dissertation do I hand in & what to consider?” with the key points you need to know about your dissertation of choice! 1) The monograph is what one always wrote in order to get the PhD degree. It’s been around for centuries – as long as PhD degrees have been awarded, this was the thing to do. But, with the growing importance of academic papers (peer-reviewed articles) and the simultaneous declining importance of scholarly works published as a book (monograph) in many disciplines, this has shifted. 2) The paper-based dissertations emerged as an alternative to the traditional monograph, around about 20-25 years ago. From a history-of-science perspective, that means ‘recently’! And, just so you know: a paper-based dissertation may also be called a ‘cumulative dissertation’, but it’s the same thing. Which type is more common? The paper-based dissertation is more common in the natural sciences, life sciences, medical sciences, engineering and quantitative social sciences than in the humanities. So one determining factor is the research area in which you work. Also, different countries still have different preferences, or are about to shift from monograph to paper-based dissertations. Often, PhD students opt for a paper-based dissertation at the beginning of their PhD studies, but that may change during the PhD process. Who decides what can be handed in? The university from which you graduate, and more specifically your faculty decides. Even within your faculty, your specific discipline can hammer out particular requirements for submitting the dissertation. In some countries this is also subject to ministerial orders, governmental acts, and rulings. The university regulations are the framework within which you operate. Now let’s give you a better understanding of the key features of the two types of dissertations, their main differences and what this means for your PhD. What you submit: A research-report with a comprehensive record of pretty much the total research you did during your PhD time. It can include all findings of your study right from the start until the end. Authorship: You are the only author. Language: The monograph might be written in the national language. You may have an option to choose between your national language(s) or English. Lengths: It varies. We’ve seen anything between 100 pages (a bit on the short end) and up to 1,500 pages. No kidding, this was a human geographer who graduated after 12 years and today is a professor at a university in the Netherlands. Most monographs would be in the range of 150 to 250 pages. 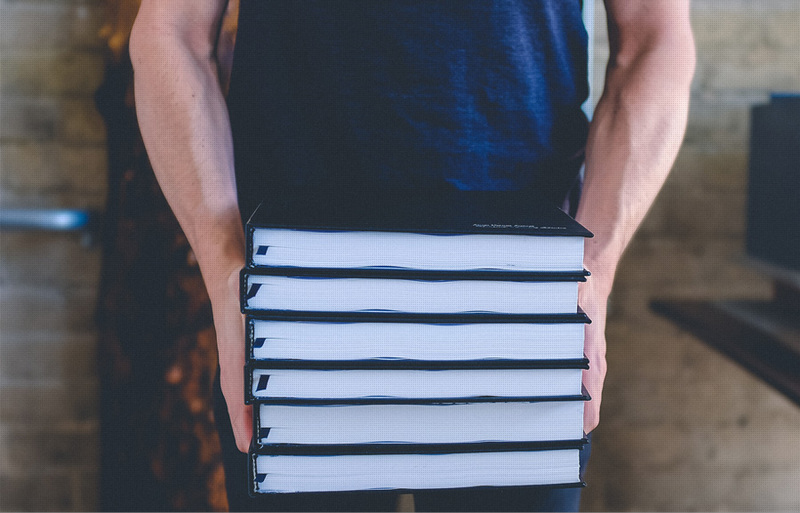 Are you handing in a heavy weight monograph? If you opt for a monograph, you’ll have this grand piece of work – all done in your PhD years – and it will remain for the rest of your life. It looks impressive on the book shelf in your office or in the library. You have a lot of freedom in the way you write, deciding rather freely on the layout, and how to include photographs, tables, figures or data-sheets. You’re not dependant on any external determining factors like the editorial and peer-review process of a journal. That means you have more freedom with the timeline in which you write your dissertation – it is you who makes the decisions. What is often considered problematic about the monograph in the natural sciences and life sciences, is that most scholars find it too much to read in comparison to papers. Ask yourself: How many monographic PhD dissertations have you read cover to cover? One? Hmm, zero? If you do not plan to publish your monograph as a book with a publisher, it will have a relatively low distribution, with only a few copies going to the university library. International accessibility is then a real issue. Accessibility is further restricted if you write in a language other than English. What you submit: A number of international peer-reviewed journal papers, which must be related to the overarching topic of your PhD. The number varies between 2-5. Yes, that’s a broad margin, but it depends on your university and faculty. Many PhD regulations do not state an exact number, but leave it open, probably to have some flexibility in the assessment process. Often, however, and this is a crucial detail, not all your papers have to be accepted or published by the time you submit your thesis. So a regulation may well call for two accepted/published papers and an additional 1-2 submitted papers. Authorship: The papers normally are (but don’t have to be) co-authored. An important detail (watch out for this!) can be that your regulations give requirement on the authorship of papers you hand in for your dissertation. For example, they can ask you to hand in three published papers, and require you to be the first-author of at least two of those papers. You normally have to declare the exact contribution each author made to the publication of your papers. Language: The peer-reviewed publications you include are written in English. Lengths: Apart from the papers you’ve also got to write a binding-text. This means a substantial introduction, which also explains how the papers are related, and a detailed conclusion. The additional binding text may be in the range of 30-50 pages. Clearly, if you consider the individual papers, the paper-based dissertation presents less to read than a monograph. Through the publishing platforms or the open access platforms and indexing databases, your peer-reviewed papers are far more widely distributed and accessible. Also, the external peer-review process is often considered as a quality-label regarding your scholarly work. Assessment committees ( = examination board) often perceive it as a bonus if the main body of scholarly work of your dissertation was already accepted by an international peer-reviewed journal in your field. With 2-3 published papers in such an outlet any risk of failing your PhD at the end is a close ‘zero’. In addition, you start your academic career already having some papers to your name, whereas with the monograph you might need to write additional papers! Critics sometimes point out that with a paper-based dissertation, you never get an overview on everything you’ve done in your PhD, because for the individual papers you just “take the cream off” your research. You single out the very best and most innovative bits to write about. For the paper-based dissertation you are heavily dependant on decisions and deadlines of journals and editors. Plus, there is a risk of one or more of your papers being rejected. And that can make the entire process rather tricky. If you have to hand-in three accepted papers and you’ve got three years to complete your PhD, you’ve got a pretty tight timeline to consider. You’ve got to calculate anything between three months (that is rather quick) and 12 months (which is rather slow, but happens) for the entire peer-review process, from the day you submit your paper until you receive the letter of acceptance from the editor. The process for a paper-based dissertation is not entirely in your hands. It needs very careful planning and decision-making early on in order to avoid trouble. How can you get a smooth ride and figure out what you hand? We so much want you to have a smooth PhD process, and the best way to do this is to be really clear about the exact requirements of your dissertation! You can make your PhD process a lot easier, if you know early on, which option might be best in your case and what the specific consequences of your choice are. What to consider for the type of dissertation you hand in? Check your PhD regulations: Figure out what your PhD regulations say about the type of dissertation that has to be handed in at your university, in your particular faculty, and also in your discipline. Do you have the choice of handing in a monograph OR a paper-based PhD? dissertation? What are the particular requirements for each type of dissertation that you can hand in? Find out, what exactly you have to hand in for the monograph and for the paper-based dissertation. Ask 2-3 post-docs who have recently completed their PhDs at your university, in the same faculty and discipline. What did they hand in? Ask a friendly librarian, to source the 5-10 most recently submitted PhD dissertations in your field. What have those PhDs handed in? What do your supervisors want: Do they have clear expectations for you to write a monograph or a paper-based dissertation? Have you discussed this together? The point of reference is always the PhD regulations and what is written there. What type of research project are you working on for your PhD? This can also influence what type of dissertation is more suitable. Does your PhD project consist of a string of smaller but related individual sub-projects or experiments? Are you still able to design it that way? OR is it one big block of research or a single experiment? When will you first have publishable results? If this is rather late in your PhD due to the particular circumstances of your research, it can be difficult to get all the required papers for a paper-based dissertation through the review process so you can complete on time. Future career choice: Do you want to stay in science and progress with an academic career? Therefore the monograph/paper-based choice is CRUCIAL to your discipline. Or are you not staying in academia, but have different plans for your career? So for you, the most important thing is to get the PhD title, but it won’t matter much which type of dissertation you hand in. We hope we could shed some light on the important matter of submitting a paper-based PhD dissertation or a monograph. We would love to hear from your experiences on this topic! Did you have a good or not-so-good experience with the paper-based dissertation? What is most common in your discipline? And for all of you who completed already: What would you advise other PhD students to consider? Fact-sheet: What type of dissertation do I hand in and what to consider? Blogpost #5: How to get started with writing papers? Free expert guide: 5 strategies to avoid initial paper rejection? Want to receive more information on how to be successful in your PhD or how to publish? Sign up to our newsletter and be regularly informed about new postings and free resources.